An altitude of 5319 meters at Pin Parvati Pass is a great trek for seasoned trekkers. The best season to pin valley trek is in the month of July to September. The most beautiful region during the trek is the Pin Parvati valley of Spiti. The amazing trek tour begins via crossing over the flourishing green Parvati valley and beautiful Landscapes in Kullu which falls in the range of Great Himalaya into the Spiti valley. The heavy snow fall gives an alpine feeling and experience to remember for life time. The stunning view of The Pin Parvati Pass is full of adventure and thrills. It is a risky and difficult pass because of high altitude, lengthy crossing area away from surroundings and heavy snow fall for almost whole year. The name Pin Parvati Pass is derived after the linking of Parvati valley in Kullu and Pin valley in Spiti. The trek begins with Kullu and straight away driving to Barsheni Village. The Pin valley builds an incredible hue with the sunrise. 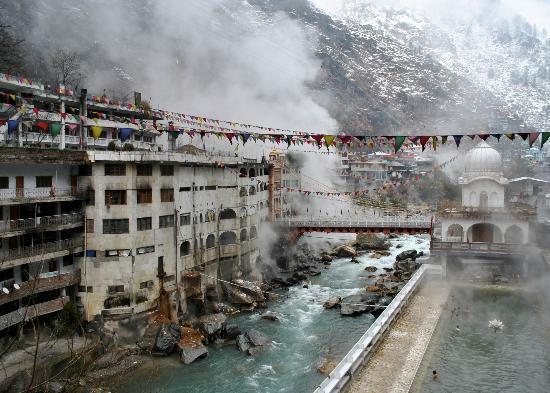 The holy place of Kheer Ganga gives a change to take a deep bath in hot spring water tank. This place is devoted to Lord Shiva. The trek ends with beautiful picturesque, inhabited villages while driving from Kaza to Manali. Sir Louis Dane first discovered this high pass in August 1884, as it links Pravati Valley from Kullu to Pin Valley in Spiti hence the name Pin - Parvati. It's a rare pass in Himachal which is not discovered by shepherds. The trek starts from Barsheni Village near Manikaran Gurudwara, a holy shrine of Sikhs famous for it's hot water springs. Stretched along the lovely Parvati River and with mountain views to the northeast, Kasol is the main traveller hang-out in the valley. It’s a small village located at 42 kilometers from Kullu at the height of 1640 meters. Almost overrun with reggae bars, bakeries and cheap guesthouses catering to a largely hippie/Israeli crowd. It's also a summertime venue for trance parties transplanted from Goa, and at any time an easy base for exploring the forested valley or just chilling out. The village is divided into Old Kasol on the Bhuntar side of its bridge, and New Kasol on the Manikaran Gurudwara side. There are many beautiful places near Kasol like Tosh Village, Rasol, Challal and Malana. The trek taverses through thick forests from the left of Parvati river. We have to cross several water streams in the way over rickety bridges and sometimes on barefoot. There are many waterfalls, muddy slopes and broken trees along the way. The path will go through many pasturelands and knee high bushes until we reach TundaBhuj at a green pasture land. We will camp here tonight. Today it will be an easy walk. We came across an unstable wooden bridge. We carefully cross over this bridge to the other side of the river and take the trail up the mountain. The Parvati Valley finally reveals itself once we reach the high point. The area has plenty of flowers and in the monsoon season you can expect the whole land in full bloom. We will cross a pulley bridge used by dam workers here to cross the river. We have to cross through the pulley one at a time. We will be able to see a flat meadow ground close to the Parvati river. This is Thakur Kuan. We will camp here tonight. The terrain from now forth goes through a series of boulder-strewn fields and multiple streams coming down from mountains connecting to Parvati River. We will take the trail ahead of Thakur Kuan, going through a meadow of flowers till we reach the river crossing section. The last 10 minutes to this spot has a series of rock fall sections so we tread carefully over the loose sand. We will reach tricky and slippery rock section over a tribuatory which is acting as a bridge. Similarly there will be another rock section acting as a bridge from here which is famously called Pandu Pul as it was created by Pandavas of Mahabharata while in exile. Now that the difficult part is taken care off we will climb up the hill we reach the level ground leading to Odi-Thach. Mt. Kullu Eiger (5664 Meters) in front of us at the right side along with some un-named peaks and glaciers surrounding the valley. You will also see a series of waterfalls on your left. As we keep walking straight ahead crossing the boulders and the water streams we will reach a level meadow along the river which is Odi Thach. We camp here tonight. Today’s trek is a gradual walk through boulders, culminating in a plateau with large array of muddy swamp land next to Parvati River. There are huge scattered boulders which need to be climbed and moraines need to be crossed until we see a suitable camping spot on a level ground next to the Manatalai lake. This area is Mantalai. We camp here tonight. Today the trail can be tiring with a lot of altitude gain. Altitude keep rising and temperature drops considerably thus making it more and more difficult to walk. It's advised for everyone to walk on their own pace and not try to push yourself. Also everyone should stay together as a team.We will encounter a tricky section where one is required to cross the ice cold river crossing on bare foot until we reach the base of a mountain. The climb from here can take anything from 4 to 5 hours to complete. The initial climb will give way to some breathtaking view of the Parvati Valley. We will also see many endangered species of plants and flowers, especially “Losars” and the “Bramhakamals”. After an hour of gradual ascent, the climb now gets steeper and brutal. Ensure a strong footing as the moraine terrain has loose rocks. After 2 – 3 hours of more climbing, we reach the point from where you see a visible snowline on the ridge. This is the Parvati base camp site. The snowline leads to the Parvati glacier with its huge ice-fall sections and hidden crevasses. We camp here tonight. We start early as we have to reach the top of the pass before noon. The pass would be over loose scree and moraine and over permanent snow. There are hidden crevasses in the area so one must be extra careful and follow guide at all times. The pass is marked by Trishuls the bird’s-eye view of the Parvati and Pin valley is fantastic. The exhilaration of traversing a 17,457 ft pass is an experience of a lifetime. The views of Pyramid Peak and White Snow Peak are also outstanding. Descent on Lahaul side is very steep and is over snow. We would use ropes and Ice Axes here. After a while the snow clears and the path is now on boulders. The trace gets enhanced as you will continue until we reach the base camp. Arriving at the campsite, enjoy the amazing views of the Dibibokri & Kulu Makalu ranges and retire for the day. There in path you can see the lovely garlands and different type of flowers which can be seen all along the way, makes the adjacent view and make very pretty sight. Enjoying the mesmeric views and the aura of the trek, we will reach a quaint little community of the Gompa region. 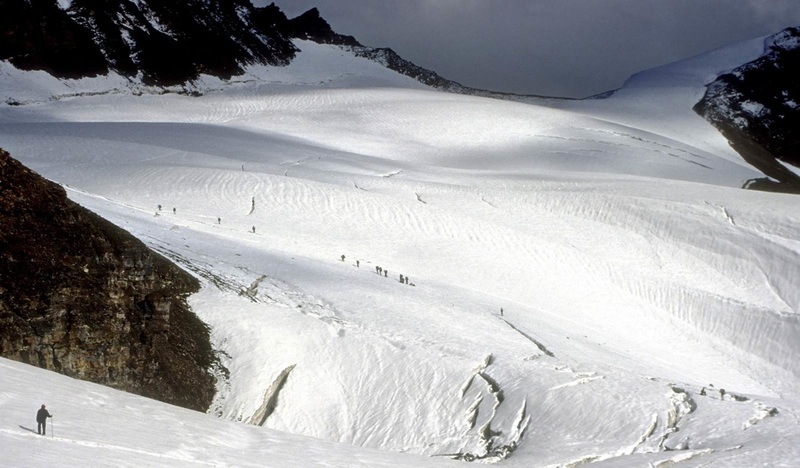 There are two different routes to reach Wichkurung Thatch from the Pin Valley camp; one passes through high glaciers with rivers on the side, and the other passes through a flowery meadow. Following the flowery route, the trek will continue through rocky terrains and will finally take you to the campsite in Wichkurung Thatch. We will camp here tonight. Today's trek, you will find huge boulders and rocks scattered all along the way. Overcome all these trails with extreme care and abide by the instructions and guidelines from the trek instructors. Along the way, you will be rewarded with astounding views of the Spiti Valley all the way till you reach Mud. The sight of a village after so many days will be thrilling. Post lunch; take an enthralling drive to the Kaza region and enjoy the magical views throughout the drive; overnight stay in Kaza. Waking up in the morning, take a day long drive from Kaza to Manali. On your way, take some time to enjoy the immaculate beauty of the pictorial meadows and appealing waterfalls. The drive will take you through high altitudes and will offer enthralling views of the snow clad peaks and picturesque mountains. After arriving in Manali, check-in into a hotel; overnight stay in the hotel. Click here to know what's included in your package and what more to bring?